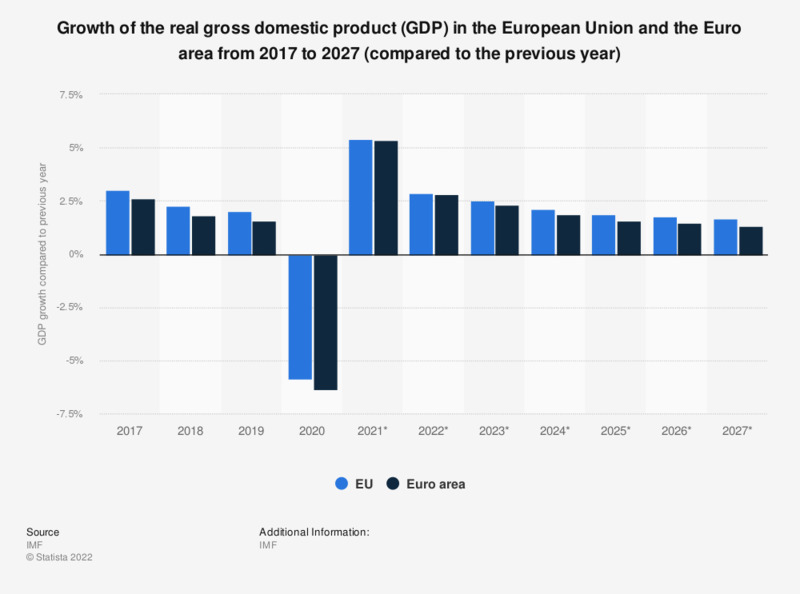 The statistic shows the growth of the real gross domestic product (GDP) in the European Union and the Euro area from 2012 to 2017, with projections up until 2022. GDP refers to the total market value of all goods and services that are produced within a country per year. It is an important indicator of the economic strength of a country. Real GDP is adjusted for price changes and is therefore regarded as a key indicator for economic growth. In 2017, the GDP in the European Union increased by about 2.66 percent compared to the previous year. The euro area, which is also called the eurozone, is an economic and monetary union (EMU) which includes 19 of the 28 European Union member states which have formally adopted the euro. Those countries include Austria, Belgium, Cyprus, Estonia, Finland, France, Germany, Greece, Ireland, Italy, Latvia, Lithuania, Luxembourg, Malta, the Netherlands, Portugal, Slovakia, Slovenia, and Spain. Member states which have not yet adopted the euro include Bulgaria, Croatia, Czech Republic, Denmark, Hungary, Poland, Romania, Sweden and the United Kingdom. Additionally, there is the so-called Schengen Area, which is composed of EU and non-EU states, and has been established mainly to facilitate travelling in Europe. While some countries, such as Kosovo and Montenegro have adopted the euro unilaterally, they are not formally part of the eurozone. Others have established a monetary agreement with the EU to use the euro, such as Andorra, Monaco, San Marino and the Vatican, but they do not form part of the official euro area. As can be seen in the chart, annual GDP growth slumped in 2012 and 2013, presumably as a result of the global financial crisis, in both the EU and the euro area. In 2013, growth began increasing ever so slightly and in 2014 the EU regained a bit of stability. However, overall recovery in the EU has been relatively moderate and gradual; growth throughout the EU has been slightly better than in the euro area and is projected to remain slightly better for the foreseeable future. Relatively new member states such as Romania and the Czech Republic, which have not yet adopted the euro, reported the highest annual growth rates in the EU in 2015, and generally, new member states show slightly better growth rates. Also, unemployment has been slightly higher in the euro area compared to the EU for the last ten years (267906). The unemployment rate also remains relatively high for both the EU and the euro area. As for public spending as a share of GDP, these figures are slightly higher in the euro area than in the EU as a whole. The member states with the highest national debt include the United Kingdom, Italy, France and Germany - some of the oldest members of the euro area. The national debt of the euro area is slightly higher than the national debt of the EU as a whole, underlining the economic situation of both areas.